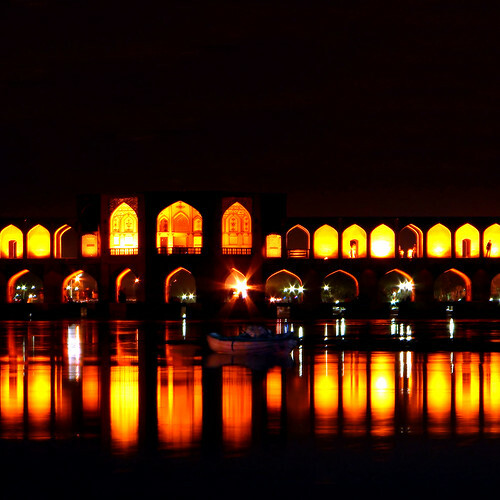 Here is a 350 years old beautiful bridge in Isfahan which is almost unknown to the outside World. Built on the foundations of an older bridge around 1650, it is a classic example of arch bridge. It is 105 metres long, 14 metres wide and has 23 arches. It links the Khaju quarter on the north bank of the Zayandeh River with the Zoroastrian quarter. A notable feature of the bridge is that it also has sluice gates under the archways to regulate the water level of the river. When the sluice gates are closed, the water level upstream of the bridge is raised to facilitate the irrigation of the many gardens along the river upstream of this bridge. The downstream side has a series of steps to facilitate easy access to the water for laundry etc. The central aisle on the upper level of the bridge is the main passageway and the vaulted paths on either side are for use by pedestrians. Octagonal pavilions in the center of the bridge on both the down and the upstream sides provide vantage points for the remarkable views and now have teahouses. The lower level is accessible on foot, provides a cool shady place for relaxing. The bridge is well illuminated in the night and provides a beautiful sight. I couldn't find any information whether vehicular traffic is now allowed over the bridge or not. Perhaps some reader in Isfahan/Iran can throw some light on this. Source of info: Wikipedia and Link to some great photos. I love the bridge! It's pretty!